If we fire teachers to fix schools, who will take their place? Under No Child Left Behind, schools serving the most disadvantaged populations of students are doomed to jump through the Machiavellian hoops of norm-referenced accountability. Indeed the expectations of these schools share much in common with the perennial “Saw” movies. Schools are expected to chew off their own arms in order to escape the chains of the testing apparatus, only to find they must climb a ladder to get out of the cage. In the star-studded film Armageddon, scientists discover a giant meteor racing towards the Earth, and summon up a crack team of experts and load them into a top-secret armor-plated space shuttle with unheard of capabilities. Just when you think the world is going to end, the U.S.A. pulls an ace in the hole by revealing that they have all the technology in place to stop an impending disaster, and the people to do it. (Why you would keep this technology secret is the real question.) Part of the metaphor, which will at some point be clear, is that, while no one knew about it, we had actually invested vast resources to address problem that, while inevitable, was highly unlikely in any finite amount of time. In the real world, Armageddon is going on in many schools across the country. Thanks to No Child Left Behind, and its successor, Race to the Edge, States are implementing drastic measures at schools that have been deemed underperforming by intergalactic standards. These measures can include firing the principal, firing or moving the teachers, and closing the school. Now, on its surface these measures might sound reasonable. If a school were something like Jabba’s Palace, it would make good sense to shut the place down. But to set foot on the grounds of some of these “failing” schools, one would be hard pressed to find a lack of effort, a lack of caring, or anything other than the hardest working people around, dealing with impossible objectives and stark realities that remain unchanged, and in some cases, worsened, by education policy. I teach in a school that probably missed California’s official “Your F’’d List” by a decimal point. The characteristics of nearly all of the schools on this list are: 1) They serve students who live in poverty. 2) The education level of parents of their students is low (many having not finished elementary school) 3) Drugs and crime are common in the communities served 4) They have a high percentage of students who are still learning English. These are schools working extremely hard, some having great success, but not meeting the bar set in an ivory tower far away, where only data matters, and only th simplest and easiest to gather data (The McNamara Falacy). 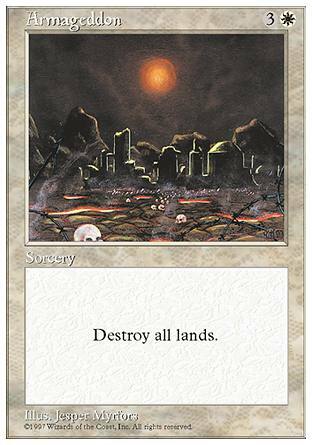 In the card game, Magic, the Gathering, the card called Armageddon destroys all lands in play. Land, in the game, is the source of energy, the ability to make progress. The card debilitates everyone playing, including the “caster.” Firing all the teachers works the same way. The teachers are everything you’ve got. There are some notable ironies in eliminating the teaching staff of struggling schools. Often, these schools have staff with the least experience. Many schools in tough neighborhoods have work conditions that are not conducive to teacher retention. Teachers might get frustrated with the quality of the facilities, the lack or resources and support, their sense of safety, the pressure of unreasonable expectations, or the overall difficulty of the job due to the disadvantages of the students. These teachers might not have the highest qualifications. Those who did, mostly went elsewhere. These teachers might have only 1 to 3 years on the job, they’re struggling to figure things out, and the State comes in and says they’re out of job, and replaces them with ??? Another ironic situation can arise for some of the most experienced, hardest working teachers who have committed their lives to working with the most difficult populations of students. Imagine a teacher who has taught for 20 years in a school where many others have come and gone, who knows the student population, has strategies for working with students from poverty, English Language Learners, or students without parental support. Now imagine that teacher caught up in a policy that fires all the teachers in a given school, in the name of reform. Back to the movie: There is no secret bunker with an armor-plated space shuttle. There is no warehouse full of highly-qualified teachers ready and willing to go into any high-need school and perform miracles. We need policies that are based on best practices, not pipe dreams. Do we really want Owen Wilson teaching Math? Let’s work with the resources we have, intelligently, and not start Armageddon. Good Administration or governance requires knowledge.Our Democracy rests on the quality of public education. The fundamental unfairness in funding, opportunity, and achievement in America’s schools is the underlying reason for a significant portion of federal education funding (Title 1), and is both a reflection and contributing factor to the continued divisions and disparity between socioeconomic, geographic, and racial groups in the U.S. Include language in the bill that establishes the requirement of a minimum adequate education and adequate school facilities for all school age children in states receiving funds under ESEA. The definitions of these terms would be vital, but could include items such as course offerings, athletics, class size, staff to student ratios, individualized assistance, and so on. Such an approach could be similar to H.R.2373 – The Student Bill of Rights (Fattah). Include language in the bill that prevents the limiting of curriculum and educational offerings in schools in states receiving funds under ESEA. Such language could be included in the bill both to clarify the purpose of providing federal funds for education and to prevent the kind of abuses that occurred in response to No Child Left Behind. Under NCLB, schools were rewarded for “gaming the system” by reducing course offerings or redirecting time away from the subjects that were not tested to Mathematics and Language arts. By reducing time spent on PE, science, history, and the arts, schools could show marginal gains in achievement, while depriving students of uncounted and undocumented learning opportunities. This provision could specify that education should be well rounded, and should include a wide variety of subjects for all students, regardless of their language ability, ethnicity, or disability. Such language was circulated in the 110th Congress by Congressman Mike Honda. The degree of inequity in funding in the state; highest publicly funded schools vs. lowest, as well as average funding levels, etc. Perhaps in coordination with the National Center for Education Statistics or one of these research bodies. 2) Create an office of Education Equity in the Department of Education to study and to provide assistance to states to address the inequities in their schools. The office could be responsible for assimilating state data on educational equity, publishing reports on nationwide equity issues, in coordination with other statistical bodies. 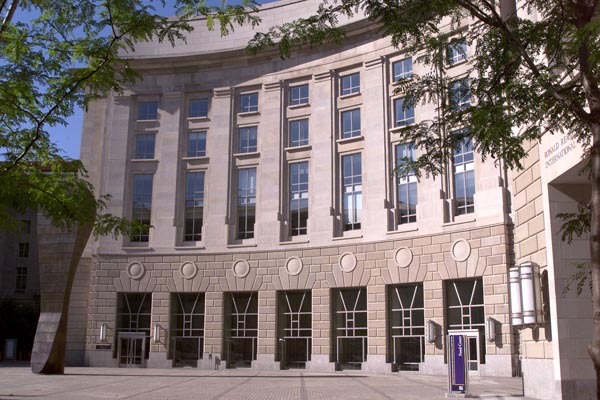 The office could also act in a capacity to assist states in revising their tax codes, budgets, and education codes in order to implement equitable education in their state. 3) Amend the U.S. Constitution to establish education as a fundamental civil right to be preserved and maintained by the federal government. This is a ‘hammer of the gods’ approach to addressing a broad variety of issues, while creating a whole new set of problems to deal with. 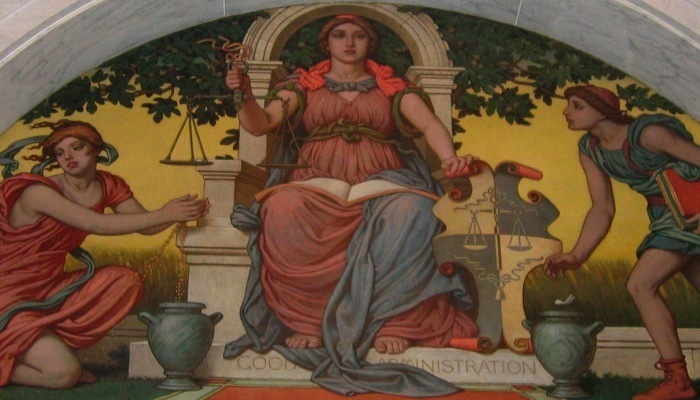 The U.S., in spite of what you may read or hear, does not have a cohesive education system, it has 50 separate ‘systems’ that are often in competition with one another for Federal funds. The Federal government doesn’t coordinate our education system, it herds the United States of cats. The Albert Einstein Distinguished Educator Fellowship is a special opportunity for math and science teachers to work in Washington D.C. in various government agencies or in the U.S. Congress, in order to contribute to federal policy. Participating teachers are expected to take their experience back to the classroom or education community in order to become teacher leaders, however, some many have stayed in positions working on education or science policy. During my fellowship, I had the opportunity to work in the U.S. House of Representatives with Congressman Mike Honda of Silicon Valley, working on issues related to education and the environment. 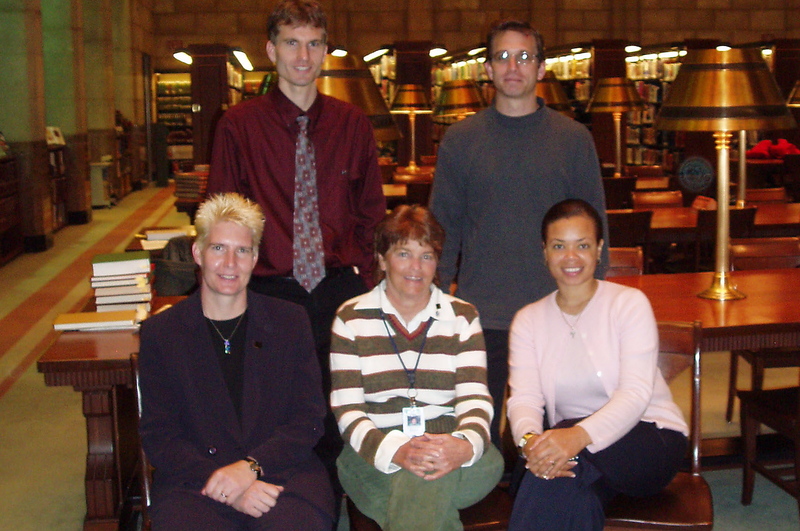 2010 marks the 20th Anniversary of the Einstein Fellowship. Consequently, several fellows are working together to plan the Albert Einstein Distinguished Educator Fellowship 20th Anniversary Summit, also known by the planners as the E20 Summit. The 20th Anniversary Summit is destined to be an event for the ages. The Summit will bring together current and former fellows, some of whom returned to the classroom to be leading science and math teachers, and others who became policy experts, legislative aides, or took positions in the administration. The Summit will be a meeting of the minds of people with experience in the classroom as well as public policy, to address the pivotal issues of the day, in Education, in Policy, and STEM (Science, Technology, Engineering, and Mathematics). The Summit will produce a written product, possibly the “Einstein Report” collecting the wealth of knowledge of Einstein Fellows, and offering policy recommendations to improve education. I’m looking forward to this amazing experience. The Einstein Fellowship 20th Anniversary Summit will be held in Washington D.C., June 27-30, 2010. I like to read books on economics. I’ve found time and again that my field, education, is inextricably tied to economic shifts and economic policy. Two books I’ve read recently deal with the details of what’s been going wrong in finance, monetary policy, fiscal policy, and government that has led to the current recession, and don’t bode well for the future of U.S. prosperity.